Yule-Mate is a highly sophisticated, multi-processor equipped, full-service Christmas analysis, shopping and delivery robot that takes the whole headache of holiday gift-giving right out of your hands. "I first came up with the idea about two Thanksgivings ago," Dr. J. Arthur Grinchley, inventor of the Yule-Mate and chairman of Christmas Industries, Inc., said, "when I felt that familiar tsunami of holiday dread crashing on the angst-strewn shores of my pre-Christmas soul. How, I thought, was I to find presents for all the people I needed to buy presents for? Where would I get the time? The money? How would I know what presents they'd like, and which ones they'd spit on and throw back in my face? That's when I decided to build a robot that would take care of all those things for me. The result: Yule-Mate." The heart of Yule-Mate is a powerful quantum computer that can perform over one trillion Christmas-gift-related computations in under a microsecond, yet requires less power than a strap-on abdominal toner. Equipped with a multitude of neural sensors, face recognition software and interfaces to most popular email systems and communications devices, the Yule-Mate can independently develop a prioritized list of Christmas gift recipients, complete with individually tailored gifts. "The beauty of Yule-Mate is that it does everything—literally, everything—completely on its own. You could sleep from Thanksgiving through New Year's, and still give everyone you know thoughtful, personal Christmas gifts right on time," Dr. Grinchley said. Yule-Mate interfaces seamlessly with Microsoft Outlook, Google Mail, Yahoo!, AOL and numerous other email and social networks. The system continually analyzes correspondence frequency and content, enabling it to rapidly develop a "big picture" of all those who should and should not wind up on your Yule-Mate Christmas list. One secret of Yule-Mate, Dr. Grinchley said, is that it is a "year-round companion", not just a seasonal holiday helper. 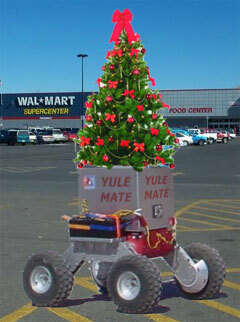 Christmas Industries, Inc. recommends allowing the Yule-Mate to be present during many or all interactions with other people throughout the year, during which the robot will quietly record facial gestures, speech patterns and syntactic audio data to determine whether the relationship between its owner and the other party or parties qualifies them as potential Christmas gift recipients. Slights, snubs and sarcastic remarks automatically move people down the list, while acts of kindness or generosity move them up. The Yule-Mate DNA Analysis Module calculates genetic proximity and moves people up or down the list accordingly. Similarly, the unit's wireless access to federal and state marriage license records will ensure that your spouse isn't overlooked, which could otherwise be a cause of friction in the holiday home. Once Yule-Mate has finished making a comprehensive list of Christmas gift recipients and checking it twice, in the process finding out who's naughty and who's nice, the next revolutionary feature of Yule-Mate activates: Auto-gift. "Auto-gift is really the most useful aspect of Yule-Mate," Dr. Grinchely said. "That's the part of Christmas gift giving that always used to make me tear my hair out in big clumps – the shopping." First, Yule-Mate auto-discovers the addresses and/or workplaces of everyone on the Yule-Mate gift list via Wi-Fi directories and GPS networks. The polite, stylish robot then independently visits each individual – optionally disclosing who it belongs to, to raise and/or lower anticipation levels among future gift recipients – and painlessly inserts a thin titanium probe into their brains' pleasure centers. In less than a minute, Yule-Mate's probe extracts detailed information about what kinds of gifts the intended recipient is likely to enjoy – or hate – and also determines with an 80-90% accuracy rate how much money they expect the giver to spend on them. Yule-Mate then cross-references the neural data with the latest trends in trendy gift ideas, accessed via the year's top ten or most popular Christmas gifts lists on wireless tabloids, and cross-tabulates for the age, style, location (urban, suburban or rural) and haircut of the recipient. When that data has been collected, Yule-Mate proceeds to do the shopping – automatically and with no intervention on the owner's part. "Another thing that used to bug me about Christmas was the money aspect," Dr. Grinchely said. "Even if you would like to give a bunch of presents to people, and know what you'd like to buy for them, there's no guarantee you can afford it. A little extra tweaking, and presto, Yule-Mate's got you covered." For those whose finances are strained to the breaking point by Christmas seasonal obligations, Yule-Mate comes equipped (standard) with a sophisticated fraud generating engine that can collect the required wherewithal in a matter of weeks. Users choose from a wide assortment of cash-generating options, including auto-Ponzi scheme, auto-Phishing attack, or auto-Nigerian email scam. "The important thing is to activate Ponzi mode a month or two before Christmas," Dr. Grinchely said, "to give Yule-Mate enough time to raise the cash. Luckily, Yule-Mate has a built-in calendar and reminder system to help you out in that respect." Once cash has been secured and the shopping completed, Yule-Mate's auto-wrapper encloses the Christmas gifts in a choice of festive holiday wrapping paper (bow-tying module sold separately), labels the packages with short, thoughtful greetings that can be humorous, loving, or businesslike, depending on the gift's target (pungent one-liners and Biblical quotations modules are available as optional accessories), and delivers them on either Christmas eve or Christmas day, depending on tradition. To ensure the packages are well-received, the built-in HD recorder activates automatically at the sound of paper ripping, and the auto-Taser will quickly turn frowns upside down for Christmas grumps. In the unlikely event a gift must be returned, Yule-Mate effortlessly handles the entire process, even phoning the unsatisfied recipient several times in the middle of the night to complain about their finickiness and ingratitude. "Once you turn your Christmas nightmare over to Yule-Mate," Dr. Grinchely said, "you'll never have to hear a mall loudspeaker screech Jingle Bells again." Yule-Mate standard and deluxe models will be available starting next week wherever Christmas is sold.